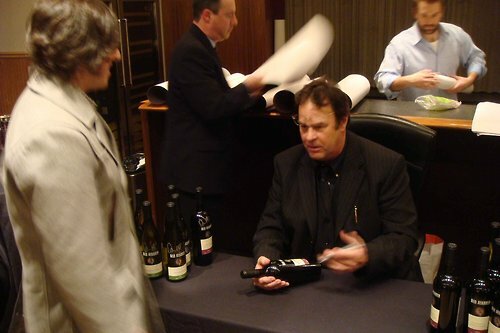 This is an old image from 2009 of Mr. Dan Aykroyd and myself, at one of the many wine tastings held weekly at Union Square Wines (USQ) in Union Square, NYC. At another USQ wine event, Kermit Lynch was on-site with a wide selection of his favorite wines. Lynch himself was full of witty charm and conversation. The man has done for wine what Billy Graham has done for Christianity. His book, “Adventures on the Wine Route” presents a marvelous, insightful journey into the cellars of winemakers across France’s wine regions—a must read for anyone even remotely interested in wine. At a recent “mega-tasting,” the following wines were offered: Scholium Project, Domaine Ostertag, Robert Foley, and Shelter, as well warming reds from Hestan, Orin Swift, Charles Cimicky, Anthill Farms, Catena, and Di Majo Norante, as well as a few more.